It’s easy to understand how you would pit G Suite™ and Office 365™ against each other. As direct competitors, they play in the same category. It wouldn’t be a stretch to call it all-out business warfare between Google® and Microsoft® in this important cloud category. So, why would G Suite and Office 365 be compared to Directory-as-a-Service® as well? Is the cloud-hosted directory a competitor to G Suite and O365? Sometimes, IT admins think that they can get core directory services from G Suite directory or Office 365’s version of that – Azure® Active Directory®. The truth is, when IT admins dig in, they quickly realize that neither G Suite nor Azure AD is trying to be your core, authoritative directory services provider. In fact, both are really adjunct directories. As such, they both work well with the modern Identity-as-a-Service platform called Directory-as-a-Service. While G Suite and O365 have really replaced the on-prem Microsoft Exchange email server, neither has tried to take on the historical market leader, Microsoft Active Directory. This makes a lot of sense for them because both solutions were created under the assumption that AD was the core identity provider for an organization. Thus, there was no reason to target AD for replacement. For IT admins, the story is very different. They’re the ones tasked with managing a rapidly shifting, increasingly decentralized IT landscape. The IT landscape has dramatically shifted. Instead of the world being all Microsoft Windows®, it is now a mixed-platform environment. In fact, only one in five devices is Windows [Forbes]. 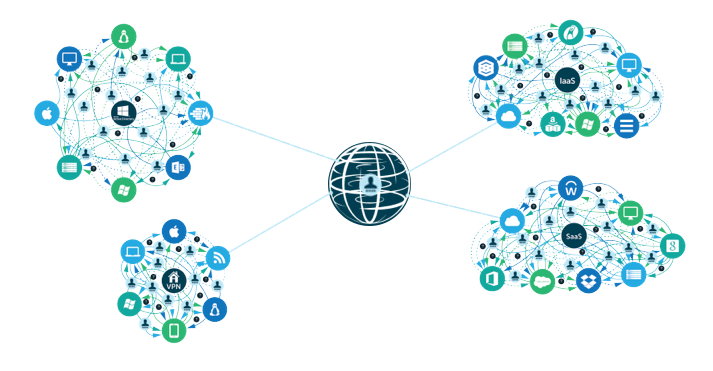 The data center has largely shifted to be AWS® and in the cloud. Instead of Windows-based applications, browser-based applications are now the norm. The network is not wired, but wireless. All of these changes mean that the core directory service – often Active Directory – no longer makes sense. So, the integration path for G Suite and O365 into AD is not as valuable to them as shifting to Directory-as-a-Service, our cloud-hosted directory service. The virtual identity provider seamlessly integrates with both G Suite and Office 365. It supports Windows, macOS®, and Linux® devices whether on-prem, in the cloud, or anywhere else in the world. On-prem applications are as easily integrated as cloud ones. In addition, the assumption that controlling access to the WiFi network is a priority is integrated into the platform for cloud RADIUS functionality. 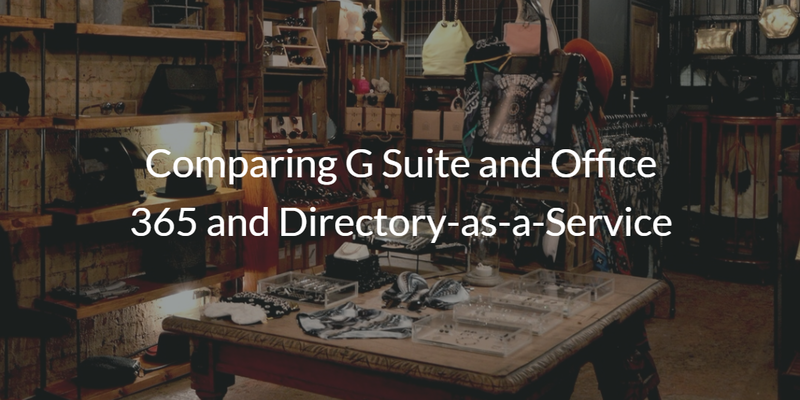 Comparing G Suite and Office 365 and Directory-as-a-Service isn’t about email hosting or productivity apps. It is about achieving central management and user access control to all IT resources across your entire enterprise. G Suite directory and the Office 365 directory surrogate, Azure AD, aren’t true directory services. They are local user stores. If you would like to have a cloud identity management platform for your entire organization, take a look at Directory-as-a-Service. You can sign up for free and integrate with both G Suite and O365. Your first 10 users are free forever.